We have been VERY fortunate on Cape Cod to have faired the hurricane season well...thus far. What's been interesting, certainly in my yard, has been the quiet due to lack of birds last week while we were dealing with winds. Sunday was one of those incredible & hard-to-believe-so-gorgeous-outside type of days! There were birds all over our yard, grazing, feasting, bathing... They knew that particular storm had passed after five days of rain, mist & gusts. 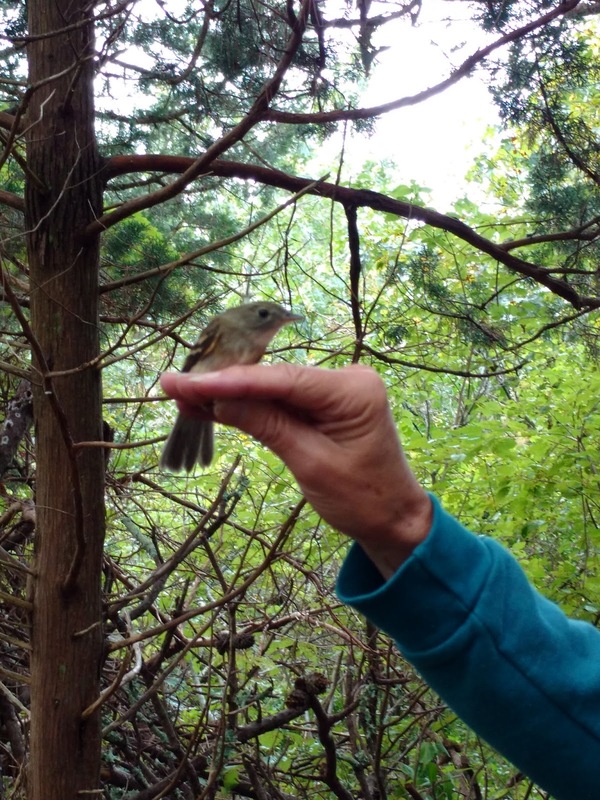 We were certainly treated to several species on this Tuesday Tweets as well, and talk about a gift...we bumped into Sue Finnegan a Master Bird Bander!!! I explained that the pouches around her neck each contained a different bird! I felt like I could hear jaws dropping. 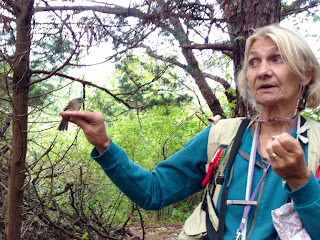 Sue generously shared an Alder Flycatcher with us on hand, IN HAND!!! (see photo below) She does amazing work and I always get excited when we sneak in a quick visit with her in the field. Old Man's Beard Lichen - a tell tale sign of healthy fresh air!